All transactions are safe and secure with a reliable history in online purchasing behind each of our associates. Buy the Big Lebowski Quotes t-shirt to own Big Lebowski clothing and merchandise. Pair this quotes tee with one of the Shomer Shabbos Big Lebowski t-shirts for the ultimate Jeffrey Lebowski / Walter Sobchak (John Goodman) combo. This t-shirt displays a collage of various movie quotes, including classics like, "Hey! Careful, man, there's a beverage here! ", "This aggression will not stand, man," and "That rug really tied the room together." The design is perfect for reciting The Big Lebowski movie quotes as you sip on your own alcoholic (or nonalcoholic) concoction. Use this design to make your friends aware that you abide, man. 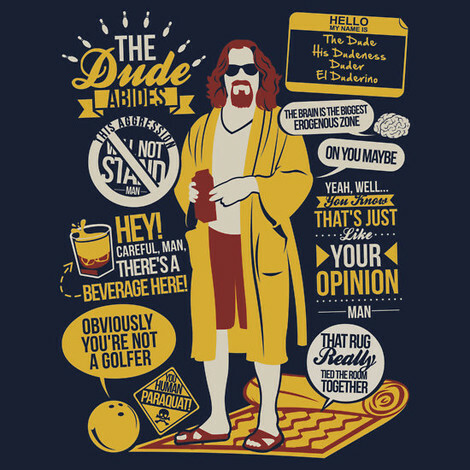 In addition to the Big Lebowski Quotes tee above, browse the Big Lebowski Clothing Gallery for more apparel like men's and women's clothes, kids shirts or hoodies.